Latex allergy affects about 1 in 25 Americans, and reactions can range from mild to severe. In some extreme cases it can be life-threatening.2 Therefore it is important to learn the symptoms of latex allergy, and which groups are more at risk of developing it. Natural latex or natural rubber products are found in many items that we use every day, such as: balloons, rubber bands, rubber household gloves, bandages, rubber balls, athletic shoes, tires, tools, waistbands and toys. There are certain high-risk groups where this condition is more common. For example, children with spina bifida, where an estimated 60% are allergic to latex.5 Children and people who have had lengthy surgeries or need frequent medical treatment are also at high risk. Latex allergies are often more common in people who have constant exposure to latex products, such as gloves. This is why healthcare workers, people who work in rubber manufacturing, childcare providers, food service workers and housekeepers are also at risk. Latex is still a component of many medical supplies, like disposable gloves. 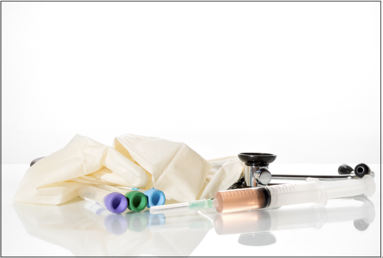 The good news is that all of Sklar’s surgical instruments and supplies, including airway and intravenous tubing, syringes, catheters, dressings and bandages are latex-free. 1 Mezher, Michael. (2016, December 16). FDA Bans Powdered Gloves. 2, 5 Kerr, Michael. (2015, May). Latex Allergies. 4 Wayne, Gil. (2016, December 1). Latex Allergy Response: Nursing Diagnosis and Care Plans. 5 Latex Allergy. (2015, October). 6 Latex Allergy Treatment & Management. (2016).